The chip industry's unrelenting quest to build smaller, faster microchips has taken another step forward. Chip-maker Intel has launched a range of processors, known as Penryn, which will power the next generation of PCs. The tiny chips contain a novel material and have features just 45 nanometres (billionths of a metre) wide. The only PC processor in the line-up of 16 chips packs 820 million of the tiny switches into an area little bigger than a postage stamp. "Had we used the same transistors that we used in our chips 15 to 20 years ago, the chip would be about the size of a two-storey building," said Bill Kircos of Intel. Paul Otellini, head of Intel, described the challenge of building the chips as "awe-inspiring". The current generation of microprocessors use transistors with features 65 nanometres wide. Although the chip-maker is the first company to make microprocessors with such tiny features, other companies, such as Taiwan Semiconductor Manufacturing Company (TSMC), are producing other types of silicon chip. "We have 45nm designs in production," said Chuck Byers of the firm. TSMC manufactures chips on behalf of other companies. 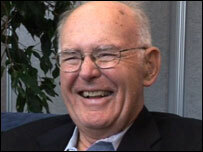 The launch of the new multi-core chips comes nearly 60 years after the transistor was invented. The brainchild of three scientists working at the research labs of the US Bell System telephone company, the tiny switches have gone on to underpin the silicon age. Basic operations flow through many areas of the chip and follow a three- step process. Fetch retrieves an instruction from the PCs memory. Decode decides what the instruction means. Execute carries it out. This instruction cycle can be done millions of times every second. Even simple operations can involve hundreds of steps. The following is a simplified version of the calculation 2+3. 1. When the user presses the "2" key data is routed to the chip. 2. Microprocessors and PCs use binary, a numeric system of "1s" and "0s". The binary code for 2 -10 - is stored in the cache. 1.The process is repeated when the “3” key is pressed. The binary code for 3 is 11. It is again stored in the cache. In reality, hundreds of commands have been processed at this stage. 1. Pressing the "+" retrieves instructions from the main memory. 2. The Arithmetic Logic Unit - a set of circuits dedicated to calculations - adds the numbers. 3. The result - 5 (101) is stored. 1. The "=" key is pressed and the chip retrieves the answer from the registers. 2. Where it was stored. Many more hundreds of operations are done by other circuitry before the result is displayed on the screen. The first transistors were crude devices made of several different materials and many centimetres tall. Over the last six decades, scientists have refined the devices and can now pack millions of them on to a square of silicon. The onward progression of the silicon industry is known as Moore's Law, and states that the numbers of transistors on a chip will double every two years. However, as the industry devices have shrunk, researchers have been forced to confront major technical obstacles. In the latest generation of Intel chips, critical elements of the transistors, known as gate dielectrics, do not perform as well. As a result, currents passing through the transistors leak, reducing the effectiveness of the chip. To overcome this, Intel has replaced the gate dielectrics, previously made from silicon dioxide, with a material based on the metal hafnium. The hafnium-based compound is a so-called high-K material, which refers to its dielectric constant, and has a greater ability to store electrical charge than silicon dioxide. The exact recipe for the new material has not been revealed but Intel says that it offers greater performance at such tiny scales. Intel co-founder Gordon Moore has described the inclusion of hafnium as "one of the biggest transistor advancements in 40 years". 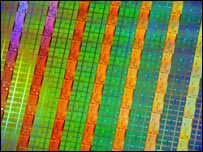 In contrast, TSMC has said that its chips do not use the new material. "We have an alternative process that we believe has even more performance value," said Mr Byers. "One of the strategies we employ is to make it [a manufacturing process] accessible as possible and one of the ways you do that is to change the process as little as possible." Rather than changing the design of the chips, TSMC has tweaked the manufacturing process to produce the tiny features. "We work very hard to maintain performance levels with existing materials," said Mr Byers. "For instance, at 45nm there are only a couple or three changes." "There are several ways to skin this cat," added Gareth Jones, also of TSMC. However, other companies have signalled their intention to start production of microchips using similar hafnium technology. IBM, which has developed rival technology with Toshiba, Sony and AMD, intends to incorporate the transistors into its chips in 2008. Hewlett Packard, Lenovo and Dell have already said that they will use the new Penryn processors in top of the range PCs.